The group stood in silence, watching a feed from the convention platform, where the Rev. Bill Shillady was to offer the final benediction, drawing from a refrain familiar to most Methodists, including Mrs. Clinton. “Do all the good we can, by all the means we can, in all the ways we can, in all the places we can, at all the times we can, to all the people we can, as long as we ever can,” said Mr. Shillady, a Methodist minister who had buried Mrs. Clinton’s mother and married her daughter. The Democratic candidate wiped her eye. We know about Mrs. Clinton’s post-convention prayer because a camera crew filmed it and the campaign posted the gauzy video on her Twitter account. It is perhaps the most intimate moment we have seen so far during Mrs. Clinton’s run for the White House, and reaction was swift. Some jeered, accusing her of sensing a political opening to attract faith voters disillusioned with her seemingly irreligious opponent, Donald J. Trump—of “I drink my little wine” and “have my little cracker” infamy. But others, including those who know her well, were thrilled that Mrs. Clinton had invited the public to see her at her most authentic, practicing the faith that, they say, has guided her from childhood through her very public career. This was not the first time Mrs. Clinton’s faith surfaced during the 2016 race. Back in January, when pressed by an Iowa voter to describe what she believed, Mrs. Clinton responded with a trinity of faith statements. “I am a person of faith. I am a Christian. I am a Methodist,” she said. Unpacking those three assertions sheds light on a part of Hillary Clinton that those close to her say is integral to how she lives her life and the decisions she makes. Growing up, Mrs. Clinton attended First United Methodist Church in Park Ridge, Ill., a white, upper-middle-class suburb of Chicago. She has said in speeches and in her memoir that she recalls her father praying each night before bed and her mother helping out in various church ministries. As a teenager, Hillary Rodham took a liking to the church’s youth pastor, Don Jones. According to a 2014 CNN profile, Mr. Jones shook things up at First United, focusing on Methodism’s social justice tradition, perhaps at the expense of the faith’s emphasis on personal salvation. Mr. Jones brought the young people to Methodist churches in dicey sections of Chicago in order to expose them to how their peers lived, in sharp contrast to their own lives in Park Ridge. He pushed them to question their faith, once arranging a debate with an atheist about the existence of God. He took them to Jewish synagogues to introduce them to different religions. His style ultimately did not mesh with conservative Park Ridge, and Mr. Jones left after just two years. But Mrs. Clinton was clearly affected, and she and Mr. Jones stayed in touch for decades after. The pair exchanged letters when Mrs. Clinton headed off to college, and Mr. Jones went on to attend both of her husband’s presidential inaugurations. Though Mrs. Clinton has cited a range of spiritual figures from varying faith communities as personal inspirations, her faith journey has been profoundly Methodist, says Mike McCurry, a professor of theology at Wesley Theological Seminary and a former press secretary for President Bill Clinton. “She is a very much a part of that tradition,” Mr. McCurry told America. In the 1960s, Mrs. Clinton was a subscriber to motive, a now-defunct magazine published by the Methodist Student Movement. During that period, the publication was largely anti-war, pro-worker and anti-nuclear weapon, publishing essays by Methodist thinkers and activists, as well as other Christians, including Thomas Merton, O.C.S.O., and Sister Mary Corita Kent, a one-time Catholic sister active in the 1960s peace movement and known for creating colorful pop art. It was during her years as first lady, one Clinton biographer argues, that Mrs. Clinton began to feel reticent about discussing her faith. The address was panned in the media, and, Ms. Du Mez suggests, remains the reason Mrs. Clinton still shies away from publicly expressing her faith more often. Nonetheless, there have been some hints throughout the years at the kind of religiosity that informs Mrs. Clinton. She is said to read snippets of Scripture each day; she has cited figures from the familiar canon of progressive, modern theologians, including Paul Tillich, Reinhold Niebuhr and Henri Nouwen, as inspirations; and during her husband’s affair with a White House intern, Mrs. Clinton is said to have leaned especially hard on her faith. “During moments of enormous personal pain for her, I think her faith sustained her,” he said. A Southern Baptist political activist named Burns Strider met Mrs. Clinton in 2006, when they bonded over how faith informs social justice issues. He then served as a faith outreach director during her 2008 campaign, and today he sends Mrs. Clinton emails several times a week with short passages from Scripture or quotations from figures she has said she enjoys reading, including the Catholic writer Flannery O'Connor, the poet Mary Oliver and the Christian writer Jim Wallis. Mr. Strider told America he is happy the campaign seems to be highlighting Mrs. Clinton’s faith, and he hopes it happens more frequently heading into November. Back in January, when an Iowa voter pressed Mrs. Clinton on her faith during a town hall event, the candidate riffed on a couple of passages from the New Testament. One of the reasons Mrs. Clinton’s religious sincerity is questioned could be the clash of her social positions with the priorities of the U.S. religious right, which is often perceived as synonymous with U.S. Christianity. Yet Methodists rank as the third largest Christian denomination in the United States, behind Catholics and Southern Baptists. The church’s numbers peaked in the 1960s, with about 11 million members, and today U.S. Methodism claims about 7.5 million adherents. Methodists are part of the mainline Protestant tradition, a slice of Christianity more politically liberal as a whole than their evangelical or Catholic peers. Ms. Du Mez says Mrs. Clinton’s religiosity can be best perceived through this prism of socially liberal Christianity, both her own tradition and the relationships she has formed with African-American pastors and churches that compose a large part of the Clinton political base. “Her views on many social issues are absolutely in line with her church’s views, with the possible exception of war and capital punishment,” Ms. Du Mez told America. The church’s “Social Principles” state, “Our belief in the sanctity of unborn human life makes us reluctant to approve abortion.” But the principles also “recognize tragic conflicts of life with life that may justify abortion, and in such cases we support the legal option of abortion under proper medical procedures by certified medical providers.” The denomination was even one of the founding members of a nonprofit group that pushes for increased access to abortion, though the denomination recently withdrew from the organization. RELATED: Will 'Extremism' on Hyde Amendment Hurt Democrats in 2016? While Mrs. Clinton’s views on abortion have become more extreme in recent years—she is currently pressing for the repeal of a ban on federal funding for abortions—Ms. Zeh told America that Mrs. Clinton still falls squarely within the Methodist tradition on the issue. The Catholic Church, of course, is against abortion, and no matter how much she draws on her faith, Mrs. Clinton is unlikely to win over some Catholic voters who reject her and her party’s views. More on Faith to Follow? With some traditionally Republican evangelicals and Catholics pushing back against Donald. Trump, it is likely that Mrs. Clinton’s team will continue to encourage her to speak more openly about her faith. It could be that her foes will continue to call her a phony when she does so. Should she decide to continue opening up about her faith on the campaign trail, Mrs. Clinton may look to a speech she gave to the 2014 United Methodist Women’s Assembly in Louisville as a model. Mrs. Clinton was introduced to a crowd of more than 7,000 women and praised as “a relentless advocate for women, children and youth,” to thunderous applause. Curiously, the woman introducing Mrs. Clinton, Yvette Richards, noted in her introduction that the former secretary of state had covered her own expenses and refused the assembly’s standard honorarium, a contrast to the $300,000-or-so stipends she had been receiving for speeches to Wall Street banks and public universities. During her speech, Mrs. Clinton delivered her usual thoughts on the need to strengthen opportunities for the disadvantaged, especially women and girls, but this time through an explicit lens of faith. She riffed on her church’s social justice tradition as well as the Gospel, focusing on the story of the loaves and fishes and how it has motivated her politics. Also see: A look at Donald J. Trump’s alliance with evangelical Christians and how it could shape his presidency. Although the Republican platform is "pro life" on abortion, Trump seems decidedly lacking in acknowledging the dignity of every life. I do not get the sense that Trump would be faithful to the Republican "prolife" platform. Therefore tho I am a Democrat for life, my conscience is telling me so far to vote for Hillary. Since Trump and his supporters can speculate on every body's motives and character I ask this question. With Trump's acknowledgement of his own prolific promiscuity how many abortions has he paid for? Your "conscience" tells you to vote for Hillary, who is unrepentantly for abortions? What does your "conscience" tell you about the sanctity of life? "One of the reasons Mrs. Clinton’s religious sincerity is questioned could be the clash of her social positions with the priorities of the U.S. religious right, which is often perceived as synonymous with U.S. Christianity." Whew. I'm glad to see this insight finally coming out of the woodwork. "One of the reasons Mrs. Clinton’s religious sincerity is questioned could be the clash of her social positions with the priorities of the U.S. religious right, which is often perceived as synonymous with U.S. Christianity." Ah, yes! Of course it's the vast right wing conspiracy's fault that Sec. Clinton is widely perceived as disingenuous & insincere! By whom? By the right wing? Astounding. Years ago I heard Mrs. Clinton use a very Catholic expression, responding to something public and stressful. I don't remember precisely what, but she uttered the words, "Mother of God!" Interesting, isn't it? A very normal thing to say in Ireland. Please. This woman can't tell the truth and taken millions in bribes. She's a criminal. Don't cover for her or promote her. She will only bring America grief. She already has, ask the Benghazi mothers. Hiding under one's religiosity is the mantra of the left wing, excusing their disrespect for fellow human beings because of "social justice", "fairness", "equality", "civil rights" or some other sanctimonious morality that covers their worship of secular power and the godhead of the state. Eight hostile investigations have found nothing to charge her with. Guilty until proven innocent, I suppose. Hillary Clinton, private faith, what a joke. God tells us in Matt 5:15…14You are the light of the world. A city on a hill cannot be hidden. 15Neither do people light a lamp and put it under a basket. Instead, they set it on a lampstand, and it gives light to everyone in the house. 16In the same way, let your light shine before men, that they may see your good deeds and glorify your Father in heaven. If you are a believer why would you hide it from the world, Jesus tells us in His word to spread the gospel. Hillary and Donald Trump are related: The Donald and Hillary are 19th cousins, according to genealogy experts. http://www.washingtontimes.com/news/2015/aug/25/donald-trump-hillary-clinton-are-related-genealogy/ So whoever you vote for they are both on the same page. America will fall know matter who you vote for and whoever wins. They are against God. They have an agenda, New World Order, New World Religion, New World Money system. Matthew 6:2-4. You can quote Bible verses all day long, and there will always be another verse to prove you wrong. Someone should tell the author of this piece that the word "religiosity" has a negative connotation. He uses it repeatedly to refer to Mrs. Clinton's apparently deep and genuine Christian faith. But that word refers to a religious nature that is falsely pious and not genuinely spiritual. The word he should have used is "spirituality" or something of that sort. Or maybe "Faith?" I wouldn't mind if Hillary and her Democratic cohorts kept their religiosity private, instead of extending it to the godhead of the state to justify abrogating the right to life, liberty and happiness accorded we the people by natural law, the Declaration of Independence and protected by the Constitution, instead substituting political "rights" of identity politics dispensed by the state, and the self-anointed experts and their cronies choosing which ones to reward. First of all, great pro-Hillary article. I didn't detect the slightest bit of impartiality. Secondly, I cannot understand how any Christian can vote for either presidential candidate. Thou shalt not kill relates to unborn children and capital offenders alike. Loving gay people does not mean encouraging their sin nor hating them for it. Welcoming the alien does not mean building walls and demonizing them. Helping the poor does not mean giving them subsidy after subsidy without trying to bring them into mainstream society by providing skills, jobs, and dignity. If Hillary or Donald really do read the Bible, we are clearly reading very different translations of same. As for the author, while you are free to campaign for whomever you want, you should really be upfront about it, and not try to hide it so much. The Fifth Commandment specifies that one must not murder, which is the case in direct abortions, but not in cases of capital punishment. I will preface my comment by saying I am a Republican who is adamantly opposed to Donald Trump &, if the election were today, would probably vote for Sec. Clinton (or simply not vote). And I have to say I find it very hard to re-read this article & its description of Sec. Clinton's Methodist commitment to social justice in light of the news that, while many thousands here in Louisiana continue to be afflicted by floods & have lost much, she is embarking on a three day fundraising tour with billionaires & celebrities - beginning with a $100,000/plate fundraiser on Nantucket tonight, while she has made no public comment, contribution of funds or supplies, or made any effort to visit to assist with flood relief efforts. Under what definition of social justice - Methodist, Catholic, liberal, conservative - is this prioritization justified? Can you imagine what good just $100,000 woudl make to a family or school here who has lost all!? And thus, while I am inclined to vote for her in view of the unprecedented nominee of my own party - I remain deeply, deeply suspicious of the choices she makes to prioritize her values. Because it just seems to me that when push comes to shove, Sec. Clinton chooses to prioritize money, & access to money, overy many other values. I am disappointed that a person of faith would choose to prioritize this situation as she has. And that also seems why many people remain skeptical of Sec. Clinton - not, as the author suggests - because of an alignment of religion with conservatism. "1 If I speak with the languages of men and of angels, but don't have charity, I have become sounding brass, or a clanging cymbal. 2 If I have the gift of prophecy, and know all mysteries and all knowledge; and if I have all faith, so as to remove mountains, but don't have charity, I am nothing. 3 If I dole out all my goods to feed the poor, and if I give my body to be burned, but don't have charity, it profits me nothing." - 1 Corinthians 13. Seeing an affirmation of Hillary Clinton's affinity with children's, women's and social justice issues in these comments builds a strong case for supporting her. The Jesuit educational mission has always emphasized social justice and Hillary has done more to advance children's rights before she was 30 than most people do in a lifetime. It is surprising the number of self-identifying Catholics who use the end of defeating her to justify any means at their disposal to do it --- in clear violation of Catechism 1789. Political activism by traditionalists often produces some odd and perverted interpretations of what God asks of us--while neglecting the essentials. So her being a Methodist is supposed to eliminate all of the lying, stealing, puffery, self enrichment, character assassination, gun running, and scheming that has led to many thousands of deaths? I do not laud her. I am ashamed of her and she should be ashamed too. I will pray for her, but I cannot tolerate her until she ceases to wield destructive power over us. Bruce, you are talking about Trump who is a lying, megalomaniac, mysogynist, communist. Of course Roger Ailes has started all of the foul things about Hillary Clinton and now the Republicans have trash for their presidential candidate. A nice little puff piece on Mrs Clinton and her alleged love for the poor. The saddest part, however, was the lament that some Catholics would not vote for the country's foremost advocate for the right to kill the unwanted unborn and for gender ideology, a system of thought which the present Jesuit pontiff calls demonic. Tut tut tut. Poor misguided things. Hillary Clinton is a person of faith. Sorry that many of the comments to this article are so hate filled- not what Jesus would do! Thank you for this article - and for the mention of Sister Corita. I am always happy to know that people still remember the Sisters of the Immaculate Heart of Mary of Los Angeles - they were "my nuns" at school growing up, and Sister Corita's art, Sister Mary Grace's music, and Sister Clarice's intellect, and many many other of the sisters all made God's presence known to me in ways that have lasted all my life. I know the Holy Spirit lives and works in wonderful and mysterious ways, so I never stop praying for all our leaders - elected and otherwise - and I try my best not to judge their hearts. I also know that many Catholic men and women support access to medically safe and legal abortion - that making it illegal doesn't end abortion - it never has. More than once, Mrs. Clinton has stated that half of Trump supporters are "irredemable". How does that comport with the Crucifixion? There were two baskets that Clinton spoke of. Why do Trump's followers keep putting themselves in the first basket? Apparently religious beliefs are fluid with Hillary. Religious beliefs must change to accommodate current political attitudes. From a speech earlier this year. 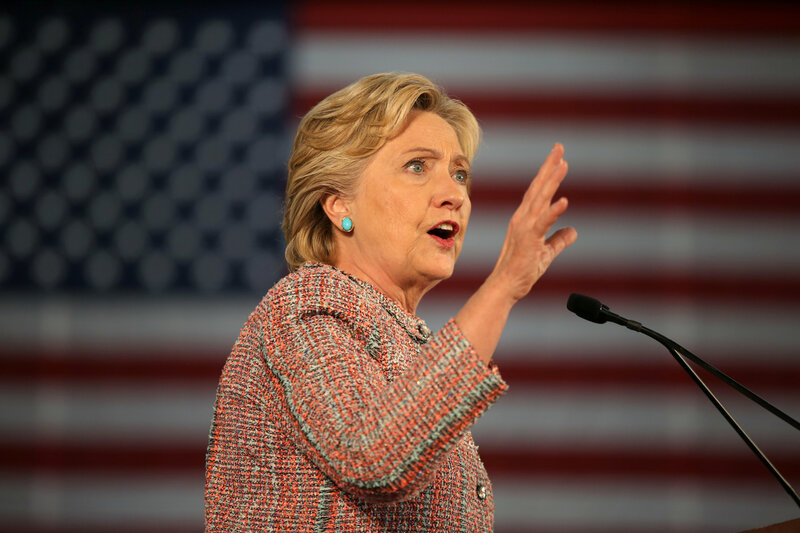 “Laws have to be backed up with resources and political will,” she explained. “And deep-seated cultural codes, religious beliefs and structural biases have to be changed. There is a great deal of speculation in these comments. Who really knows the depths of anyone's religious or spiritual commitment except God? Those who claim to know what is not known are empty vessels with issues. Further, who truly knows, objectively, the best relationship between religion and politics? If anyone had more than opinions, this would be settled knowledge and we would probably not still be debating it, as we have done for many, many centuries. A side angle picture of her with lots of people at her feet, dressed in a white suit and with her hand over her heart! Really? The article should be updated to add a newly documented example of Hillary's Faith & Works: calling millions of Americans "Deplorables" while millions more "desparate for change" given these past 8 years. There is hope, though, even if Obama was a failure as a President, and Hillary / Trump will be a step backwards. Thankfully our Lord welcomes the desperate, the Deplorables (Trump supporters) and the Depraved (Hillary supporters). Whom will the Lord favor? None. He loves us all equally warts and all. Thankfully He shows us far more mercy than we do to each other. Good News indeed! In Matthew 23 Jesus issued some very harsh judgements using inflammatory language. Hillary mentioned deplorables yes but also those who are desperate for change. Her critique was not without merit. Indeed Islamophobia and Sexism and Racism are deplorable things. Could she have used less inflammatory speech perhaps- but hate is hate and ought to be called out as such. Interesting article. Hillary is a complex woman who draws upon her faith for strength. Like many Christians, her belief system is not rooted in fundamentalism.She has her flaws but her track record also shows her to be a passionate, and even kind, advocate for the things you she believes in such as children and women's health. I am glad her faith has not turned her into a zealot. Not everyone shares our beliefs and public policy and governance should reflect that. Please. Not for us to judge what is in someone else's heart. It is by action that we understand how and what people are. Mrs Clinton has enriched herself and her family while supposedly being a civil servant. Mrs. Clinton condemns as deplorable those who do not see the world in her view. She touts her bona fides for women's rights yet accepts money for the Clinton Foundation from countries that oppress women. She has admitted being for abortions at any time. She makes claim to patriotism yet is happy enough to say we as a country need not exist, we should have open borders. I do not know Mrs. Clinton, except by her actions and I find them to be venial and her moral compass to be askew. Please! This article also appeared in print, under the headline "The Private Faith Life of Hillary Clinton," in the September 19, 2016 issue. Michael J. O’Loughlin is national correspondent for America. He is also the author of The Tweetable Pope: A Spiritual Revolution in 140 Characters.